The WB has announced dates and released images and loglines about the season premieres of both Buffy the Vampire Slayer and Sabrina, the Teenage Witch. The new season of Buffy begins on Tuesday, Sept. 26 with an episode called "Buffy vs. Dracula." "Still searching for a normal life, Buffy (played by Sarah Michelle Gellar) is shaken by the awesome power - and more than a little star-struck - when she comes face to face with the greatest vampire of all time, Dracula." Dracula is played by Rudolf Martin, who can also be seen in the upcoming movie Bedazzled. Sabrina, based on the Archie Comics character, moves from ABC to WB on Friday, Sept. 22. The show, which recently filmed its 100th episode, is beginning its fifth season. The season premiere is called "Every Witch Way But Loose." "After spending the summer trying to get over her first love, Sabrina (played by Melissa Joan Hart) decides to make some big changes in her life, including attending college and living away from home like a normal freshman. Ecstatic to finally be on her own, Sabrina discovers that college life isn't all she'd imagined when she meets her unfriendly new roommates, streetwise Roxie King (played by new cast member Soleil Moon Frye) and spooky Miles Goodman (played by new cast member Trevor Lissauer), and the house's self-absorbed resident advisor, Morgan Cavanaugh (played by new cast member Elisa Donovan). Back at home, Hilda (Caroline Rhea) and Zelda (Beth Broderick) struggle with 'empty nest syndrome.'" In a statement to the press, Mike Allred denied recent rumors that he'll be drawing Spider-Man. "No, I'm not drawing Spider-Man again -- at least not anytime soon," Allred said. "I think this rumor might have started because of enthusiastic things I said about Joe Quesada's new editor-in-chief job at Marvel as well as a future Marvel project I've agreed to do with Brian Bendis, but the only Spider-Man project I've expressed any interest in is the Madman/Spider-Man team-up , but that was proposed a long time ago." Allred also provided an update on AAA Pop Comics' The Atomics, which will undergo an upgrade in paper stock with #9. "I've always loved the feel and smell of the pulpy stuff, but we've been overwhelmed with requests to go back to the 'Madman stock' that we've mostly used since the beginning at Tundra," Allred said. "Besides, Laura has been missing the fancier paper, so here it is." Allred said that The Atomics #12, scheduled for December, will include a fold-out poster that is inked and painted by Kevin Nowlan from Allred's pencils. Mike Mignola is also doing a poster for a future issue. To kick off AAA Pop Comic's second year of publishing, Allred is swapping characters with Erik Larsen. The Atomics #13 will begin a new storyline guest starring Larson's Savage Dragon. And future issues of The Savage Dragon will guest-star Madman and members of The Atomics. "I guess we're simply responding to requests from fans," Allred said. "Erik and I have a similar level of energy that drew us to each other. And out of respect to our respective fans, our stories will connect but stand alone from each other. For me it's continuing the good times I had with The Big Guy and Hellboy in Madman Comics during the Legend years." Rob Liefeld issued two press statements on Tuesday, about his upcoming non-Awesome projects and the credit issue regarding writer Kurt Busiek on Youngblood: Genesis. "In addition to the Wolverine work that Ian Churchill and I have been producing, look for both of us as contributors to the December Superman issue, written by Jeph Loeb. As I understand it, the issue has Superman visiting various Justice League members at Christmas time. The issue is broken up into several three-page sequences featuring the individual encounters, with regular artist Ed McGuinness providing opening and closing sequences for the issue. Ian illustrated the Wonder Woman sequence and I have drawn the Aquaman sequence. Believe it or not, this provided me with my first ever opportunity to draw Superman, as well as the King of the Seven Seas, so I was pretty excited to do the work. Ian's pages look fabulous, fans will dig his Wonder Woman. I am grateful to both Jeph and super editor Eddie Berganza for the chance to be part of this cool issue. There are other guest artists as well, but I'm not certain who they are as yet. "My second Wolverine issue is out this week and unfortunately it printed extremely dark. I'm working with the guys at Digital Broome to work the kinks out and adjust the color for newsprint so that Ian's issue will turn out perfect. Ian's two issues are fantastic, easily his best work to date. Prepare to drool at his depictions of Wolvie and Spidey and a few other surprise guest-stars. I'll keep you posted on other developments as they come together." Here's Liefeld statement on Youngblood: Genesis and Busiek's involvement. "As I have stated elsewhere, Kurt wrote over 90 outstanding pages for Youngblood Year One, which he was long ago compensated for. We are now presenting it as Youngblood: Genesis, with minor cast changes, most of which were consulted with Kurt for his opinion. "Kurt has stated his displeasure with us for soliciting him as the writer of this project, which begs a discussion of what constitutes a writer? I wrote the Wolverine stories for my current run on that title which has scripting by Eric Stephenson. I am listed as either storyteller or plotter in Marvel's credits, which are categorized for pay purposes. Does this mean that I am not the writer? Absolutely not. The amount of attention that has been given this by Kurt and his assembled is due in part, in my opinion, to the fact that Kurt has no desire to see this exist as he is unhappy that we postponed it years ago. Over 14 months ago, I was agreed to postpone this comic because Kurt asked me to do so. He said his schedule was too tight and that if we waited, he would evaluate it at a later date. Personally, I had serious doubts that he would rejoin the project and time revealed that was indeed the case. As he added to his schedule I made the decision to wait no more. My staff told him we would move forward and told him we would use another scripter, he was fine and we wished him well. Now it's here and he has chosen to target the project, originally claiming on his boards that he was unaware of our plans to move forward. He has also tried to imply that we mislead people with a signed edition of the book. You will notice that no where is there a signed Busiek version solicited, which makes sense because one does not exist, but Kurt has implied we have decieved his fans by soliciting a signed version by the creative team. If we had a Busiek signature we would most certainly solicit one, not obscure it. "Kurt has stated he will not work for us again. Let me inform everyone that since Kurt wrote the Year One story, nearly 6 years ago, we have not requested further material from him. He is a fine writer but not a voice that we have sought out even at his peak of a few years back. Kurt's proclamation only ensures that the status quo will continue. "Finally, Kurt has made mention of what I refer to as the 'Phantom Youngblood' story. Phantom because no one can produce it. Not even Kurt when asked by Jeph Loeb when Jeph informed him that we would most certainly pay for it if there was issue where that concerned. Kurt also spoke to one of my staff and told him that he did not want pay because he did not want it used. Sound like an agenda? Yes. My response? Big deal. We're moving on and out of this. "In closing, I would like to note that Marvel is about to print some ancoent material that I produced for them 11 years ago. It will no doubt have been inked and finished by bullpeners since some of it was not completed when I submitted it. I'm fairly certain I have not been paid for all the material either. Some personalities would rage over this, I don't have the interest or time. Several reprint editions from Marvel feature work attributed to me that I did not produce, for example, a bust shot of Cable will appear as a full figure. Some artist completed my illo in a manner that I would never approve and I would have adjusted it for free, but I was never even given the opportunity. Does it freak me out? No. would it freak others out. It does and has. My point is, I have had legitimate gripes with other companies treatment of my work but life is too short to make waves. Apparently for others, this is not the case." Eric Mabius, star of The Crow: Salvation, will be making an appearance when the movie is shown in Spokane, Wash.
Craig Schultz of the AMC Theatre house in Spokane told The Continuum that Mabius will appear the night of Saturday, Sept. 16. 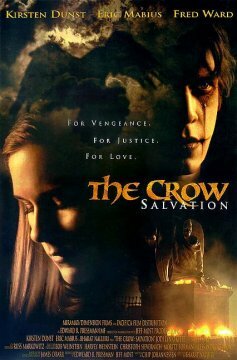 The theater will be showing The Crow: Salvation for at least a week beginning Friday, Sept. 15. Mabius appeared at the two conventions where The Crow: Salvation was screened, the Dragon*Con in Atlanta and the Comic-Con International in San Diego. Schultz also noted that talks are underway to bring Crow creator James O'Barr to Spokane as well. Sin City: Hell and Back Trade Paperback will ship on Dec. 20 from Dark Horse Comics. The paperback will reprint Sin City: Hell and Back #1-9 by Frank Miller and Lynn Varley. "In the Town Without Pity, good men are hard to find. Enter Wallace, a man of mystery. He's a nice guy who's very good at killing people. Out for an evening drive along the beach, he meets the woman of his dreams -- and she's trying to kill herself. Why? And who are the shadowy cabal of power brokers who wrench her from his arms? When will all hell break loose? Comics legend Frank Miller, creator of the groundbreaking Batman: The Dark Knight Returns, pounds out his longest Sin City graphic novel to date, a bare-knuckle barrage of brutal action, dark secrets, and heroic sacrifice. What the hell -- it's a love story. Includes color sections and pinups by a who's who of comics luminaries, including Lynn Varley's first actual comics illustration." The 312-page book will cost $25. The X-Men live-action movie placed 20th at the box office over the Labor Day weekend with $1.4 million. The film's overall domestic take was at $153.2 million. Cable writer Robert Weinberg on the upcoming villain Gaunt: "Gaunt is a conqueror. But now living at the end of time. Or close to it." Coming Thursday: Marvel news - and much more!! !